Whether an injury occurs from a work accident, a sports collision, or a fall, the BrainWaves Concussion Care’s medical team is ready to help patients in the San Francisco East Bay. The first 72 hours after a head injury are critical to assessing and diagnosing a concussion. Head injury symptoms are not always obvious and the extent of potential injury to the brain is often hard to quantify. That’s why BrainWaves Concussion Care has added BrainScope One® to its concussion diagnostic tools. 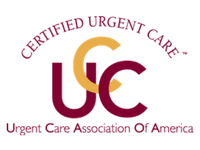 Historically, based on the injury circumstances and symptoms, primary care physicians almost always sent patients to the emergency room for further evaluation and a CT scan to rule out more severe clinical issues. This resulted in patients having unnecessary CT scans. Now there is another option. 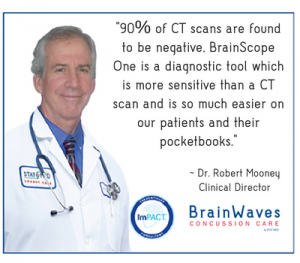 With BrainScope One®, BrainWaves Concussion Care offers a safe, effective, and patient-friendly alternative to a CT scan that can help avoid unnecessary radiation exposure and significant hospital charges. This revolutionary technology was developed in partnership with the U.S. Department of Defense and is a two-time winner of the GE-NFL Head Health Challenge. 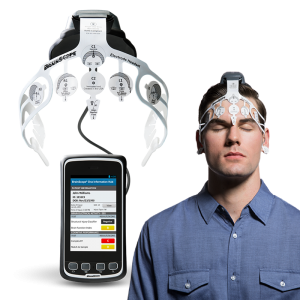 BrainWaves Concussion Care at STAT MED is the first practice in Northern California trained to provide the BrainScope One® technology to patients. No Appointment Needed. Just Walk-In. 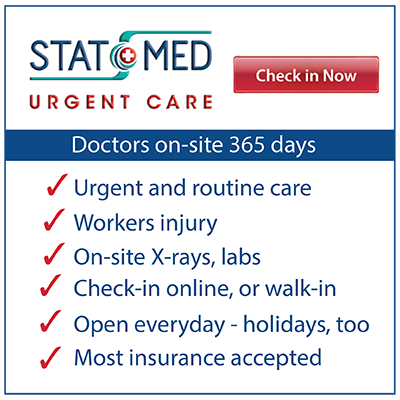 STAT MED Urgent Care, in partnership with BrainWaves Concussion Care, offers BrainScope head injury testing and other intial concussion evaluation options, 7 days a week, including evenings and holidays. If needed, STAT MED will refer you to BrainWaves Concussion Care for a customized concussion treatment plan. BrainWaves Concussion Care also offers BrainScope One® testing by appointment. Call (925)234-4447 for more information. Cleared by the FDA. This state-of-the-art technology is suitable for patients between 18 and 85 years old. Patient-friendly. It’s easy to use (patients simply wear a headset), non-invasive (no radiation! ), and does not require a visit to the ER or hospital. Accurate and comprehensive. BrainScope One® is the only device that objectively assesses the entire spectrum of injury – including concussions. It has demonstrated 99 percent sensitivity in detecting a brain injury that would be visible on a CT scan. Convenient. It involves shorter wait times, lower costs and less stress than a typical ER visit or outpatient CT scan. You can get an immediate answer about the severity of your head injury, as well as the needed follow-up treatment, all from one provider with BrainWaves Concussion Care. Depending on your medical circumstances and the time the injury occurred, your doctor may recommend continued assessment using BrainScope One®. If continued assessment is recommended, a BrainScope One® headset with sophisticated, miniaturized sensors will be placed on your head to measure your brain’s electrical activity and neurocognitive function. 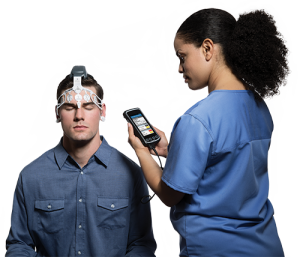 Using a handheld smartphone-like device, your data will be presented in a panel for the physician to review and determine if there’s evidence of functional abnormalities, such as a concussion. Based on these results, your doctor will discuss your diagnosis and a treatment plan as needed. BrainScope One® comes in two parts. It includes a disposable electrode headset and a military-grade smartphone with specialized software. 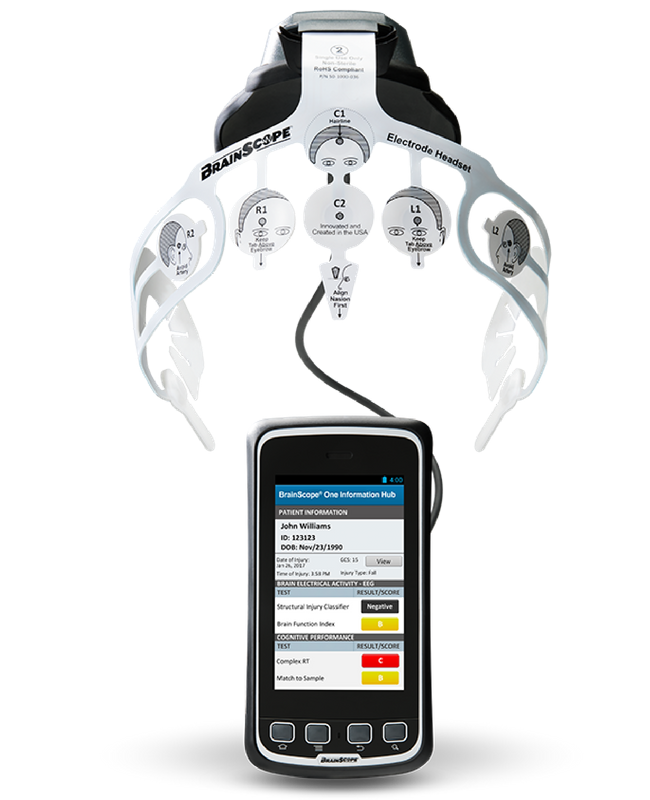 The patent-protected BrainScope One® technology platform integrates databases of thousands of brainwave recordings with advanced digital signal processing, sophisticated algorithms, miniaturized hardware, and disposable headset sensors, which are only available in the revolutionary BrainScope One® device. BrainScope-certified professionals, with deep expertise in diagnosing and treating head injuries, offer this FDA-approved technology in STAT MED’s comprehensive BrainWaves Concussion Care Program, which serves families in Concord, Lafayette, Moraga, Orinda, Livermore, Pleasant Hill, Walnut Creek, and other nearby communities. Note: BrainScope One is registered as Ahead® 300. BrainScope is a registered trademark of BrainScope Company, Inc.
1 What should I do if it has been more than 72 hours since my head injury? If it has been longer than 72 hours and you are feeling headaches, dizziness, nausea, blurred vision, or difficulty concentrating, you may have a concussion. Visit our BrainWaves location for careful neurological examination. We can determine if a CT scan is needed and arrange follow-up treatment with the BrainWaves Concussion Care program. 2Is BrainScope One® covered by insurance? BrainScope One® is an FDA-cleared assessment that has been reimbursed by insurance carriers all over the United States. 3What if I am under 18 years of age? Can I still be treated for head injury and concussion at BrainWaves Concussion Care and STAT MED? The STAT MED team can evaluate patients five years and older for concussions based on step-by-step diagnostic protocols. The Brainwaves Concussion Care program works with pediatric patients all the way through a return-to-school or return-to-play authorization.